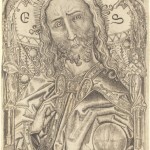 Ironically, one of the most important artists in the world of engraving is only known by the name assigned to him by art historians – Master E.S. The E and S may indeed be his initials as they are the mark he made on many, but not all, of his pieces. Master E.S. was a goldsmith engraver and his ties to jewelry making lead some to believe the E.S. was not so much a signature as a maker’s mark. Either way, this German artist is believed to be the first print artist to claim their work through a recognizable signature or mark. Just under 320 prints have been attributed to this artist who was active between 1440 and 1467 near Lake of Constance in Germany. One source believes the artist may have completed as many as 500 different prints. His prints are recognizable for their somewhat sweet and naïve depictions of people. It’s said his works indicate his ideal of womanly beauty, include a hint of humor, and blend religious themes with sensuous allusions to lust. Many of his pieces, like the one shown here, include what may be a negative commentary on religion. At first, I thought his works were simply trying to humanize Jesus, the Virgin Mary and other Biblical figures. After seeing more of his works and seeing the common themes they contained, it suggests that this is not an attempt at humor but an intentional statement of some kind embedded within his works. Considering the era in which the artist lived, it seems quite surprising that his works survived at all. While other artists showed the Holy family and Jesus in only a favorable light, his work showed an infant Jesus as gluttonous. There are some who portray Jesus as a glutton because he ate with tax collectors and other sinners. Does Master E.S. strive to show the fallacy of those accusations or further them? Perhaps, the artist intentionally created a persona for himself to hide behind, somehow knowing that not everyone would appreciate his humorous or satirical representations of Biblical figures. His talents at goldsmithing may have led to his innovations in print making. He was particularly skilled in using a Burin or printmaker's chisel. He made deeper cuts which allowed the wooden plates to be reused longer than traditional methods. He also was able to add straight lines and cross-hatches to create subtle shadings and shadows in his engravings. He is most often remembered for his ‘fantastic alphabet’ composed of grotesque figures made up of animals, knights, ladies, monks, saints and other grotesque images. 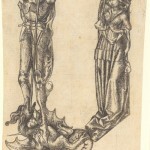 In great contrast to that work is his Madonna of Einsiedlen from 1466. The Swiss monastery of Einsiedeln was a famous shrine of the Virgin. The print may have been made as what could loosely be termed an early tourist piece made for Pilgrims (think Chaucer) and available for purchase at the sacred site. 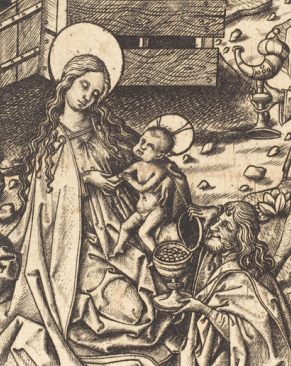 Master E.S.’s Madonna shows the Virgin and child enthroned between St. Meinrad and an angel. In front of them are a pair of pilgrims on their knees. While the entire scene is watched over by the Holy Trinity and all of the heavenly host. The most common year given for his birth is 1420. The latest date on any of his prints dates to 1467. Historians have assumed that since there were no later pieces with the mark of Master E.S. after that year, that he must have died that year. Israhel van Mechenem the Younger is believed to be a student of Master E.S. He acquired 41 of his mentor's plates. Mechenem would become the most prolific printer of his time but primarily copied the work of others. All told, he is credited with producing 600 plates, 41 of which were those of Master E.S. and another 200 of which are copies of the work of Master E.S. Selected Paintings by Master E.S.